Behind the wheel: Bang & Olufsen BeoSound Vanquish | What Hi-Fi? Last week, I was lucky enough to be invited up to the home of Aston Martin to be given a briefing on the new Bang & Olufsen BeoSound ICE (in-car entertainment system) in its newest four-wheeled fancy, the Vanquish. But before I took the system (and the car) for a spin, we were given the chance to chat to a couple of Aston Martin’s engineers, Clinton Forde and Adam Wallace. There’s a whole team that worked hard behind the scenes to make sure the Vanquish’s system was up to scratch before the first cars rolled off the production line. Talking to the guys it was obvious they were just as passionate about the system as the car and gave a really interesting insight into how they approach fitting and finessing, from the display, through to the software driving it and the actual speakers themselves. Clinton and Adam are just two members of the team that looks after the car’s audio innards, but between them there’s 25 years of Aston Martin experience. And they’re quick to point out that there’s a lot of give and take when trying to devise any car’s entertainment system: “it’s a constant battle between design and engineering – compromises have to be made and balances reached”. I’m impressed to hear the guys carry out a lot of benchmarking of rival systems when they’re developing the Aston systems too; “we’ve heard the Porsche/Burmester, Naim/Bentley and Mark Levinson/Lexus systems. "We’ve also heard the different B&O systems fitted to Audis and Mercedes-Benz cars.” When you think about it, it’s only sensible that they keep up to date with their closest rivals. How else can you hope to improve? The team have prototype cars to test for four or five months, during which time they take the car over to B&O to iron out any EQ (equalization) issues and unwelcome resonances that might have arisen. B&O was given eight weeks with one of the development cars for testing and tuning – “their facilities are second to none and they’re unwilling to compromise on performance, which is the way it should be,” says Wallace. Needless to say, the engineers spend a lot of time out on the open road. Mics are wired up and measurements are taken, including the noise generated by a stationary car and moving through progressively faster speeds. Aston Martin also has a dedicated test room containing its own surround-sound set-up, which includes Denon and Genelec components. Before they get their hands on the development cars, the engineers make up a lab car that allows them to tinker around with speaker positions, driver units and visualise how things are going to look. Bang & Olufsen first made an appearance in the Aston Martin DBS – a car many of you will have seen barrel roll into oblivion in the James Bond flick Casino Royale. 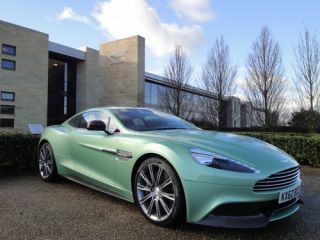 Well, the Vanquish replaces the DBS and with it comes a new system, much refined for the new car. There’s now one amp in the driving seat as opposed to two, with improved DSP (digital signal processing) to boot. Aston Martin claims the system can be pushed even harder yet remain just as composed, even more so than the old one. The engineers told me they’d fitted more electronics and speakers into the car than the previous Vanquish, yet managed to give the driver more space in the cabin. And having sat in the driving seat, it certainly feels roomy and spacious. You don’t feel cramped or claustrophobic. Fire up the engine and the fanfare of the car’s immense V12 engine is matched not only by the 6.5in LCD display revealing itself in the centre console, but by two B&O Acoustic Lens Tweeters (ALTs) rising from their housings in either corner of the dash board (see above). It’s an impressive feast for your eyes and ears and one I could certainly get used to! Besides the two ALTs, there are no fewer than 11 other speakers tucked away in the car’s chassis. The front two, 9cm mid-range speakers, are fitted in sealed 1.5-litre enclosures and positioned as high as possible in the door trim in a bid to keep a stable soundstage. The centre speaker, hidden in the top of the dashboard (below), uses a 9cm midrange driver and 1.9cm tweeter in a 1.2-litre sealed enclosure. In the rear of the car you’ve got a couple of 9cm midrange drivers and 1.9cm tweeters mounted in baffles that are built into the actual body of the car. Bass comes courtesy of three subwoofers: two 14cm drivers located in the footwell and a 20cm woofer fitted to a 15-litre enclosure under the passenger seat. The company has teamed up with a new software manufacturer for the interface and it looks pretty smart. My previous experience of Aston Martin was a DB9 fitted with B&O kit and one of the most disappointing features was the uninviting display and menus. The one on the Vanquish looks much more glossy and impressive. Icons and menu options look smartly rendered and make the system look much more desirable. Stream music from an Apple device or USB memory stick, and the album artwork looks superb. The team haven’t gone down the touch-screen route out of choice. They’d prefer it if the driver wasn’t trying to poke and swipe at a screen while they’re supposed to be concentrating on the road. Instead, you navigate using a round joystick found towards the centre console. Push and pull up/down/left and right as required and hit the centre button to select. Above sits a smaller scroll-wheel for adjusting the volume. This approach is a decent compromise, but not the most satisfying to use. It’s a little clunky, but not quite as frustrating as you’d think. You’ll find a couple of small clusters of touch-sensitive buttons for switching sources and accessing the main menu screen beneath the joystick. Press, and they vibrate ever so slightly thanks to the haptic technology that lies beneath. It’s a neat, modern touch, which Aston went for to compliment the modern styling of the car. In our test car there were a couple of connectivity options. Twin USB sockets, one beneath the central armrest and another easily accessible one at the foot of the centre console. There’s also A2DP Bluetooth support so you can stream wirelessly (as well as take and make phone calls). Our test car did without the six-CD changer, but this can be specified when required. You can also turn the car into a wireless hotspot, although this requires a 3G dongle to work. So, how does the B&O system sound? Extremely impressive – one of the best B&O set-ups we’ve heard. Like the car’s awesome V12 engine, there’s power and scale in abundance. You can crank the dial way past 11, into the realm of ridiculously anti-social levels, and the speakers lap it up. Dial it down to a more acceptable number and there’s great poise and focus. Provided you’re not using the surround mode (which spreads the sound well but doesn’t necessarily sound the most precise) both driver and passenger get an accurate soundstage to admire. When the driver’s on their own, the system is intelligent enough to know this and adjusts the focus accordingly, giving an even greater sense of organisation. Play Tori Amos’ Winter and her vocal sits right above the steering wheel. Highs are crisp and stay on the right side of sharp. The fact you’ve got three subwoofers around the driving position could be a recipe for disaster (and a migraine) but in practice results in a cohesive, nicely integrated sound. There’s nothing worse than bass which sounds like it’s coming from a different postcode. I’ve found can always be a risk with in-car systems and poor integration is normally a hindrance. That isn't the case here, however: the flowing bass performance mirrors the car’s precise handling. Stream Drake’s Marvin’s Room over Bluetooth and notes display weight and depth, but don’t sound boomy. At this point, I should point out that this is after I turn the bass down three notches – when I first got in the car, the lows intruded a bit too much for my liking. Such are the limits of Bluetooth streaming, wireless sound quality isn’t quite up to the same level of wiring an iOS device directly – it lacks a little substance and detail – but the system keeps the same accurate, powerful character. And the best part about the B&O system? It comes free as standard with the Vanquish. Some companies such as Bentley and Porches charge for their equivalent systems, but it’s good to see this £190,000 machine comes optimized from the off. It’s a great system and one I could really get used to!